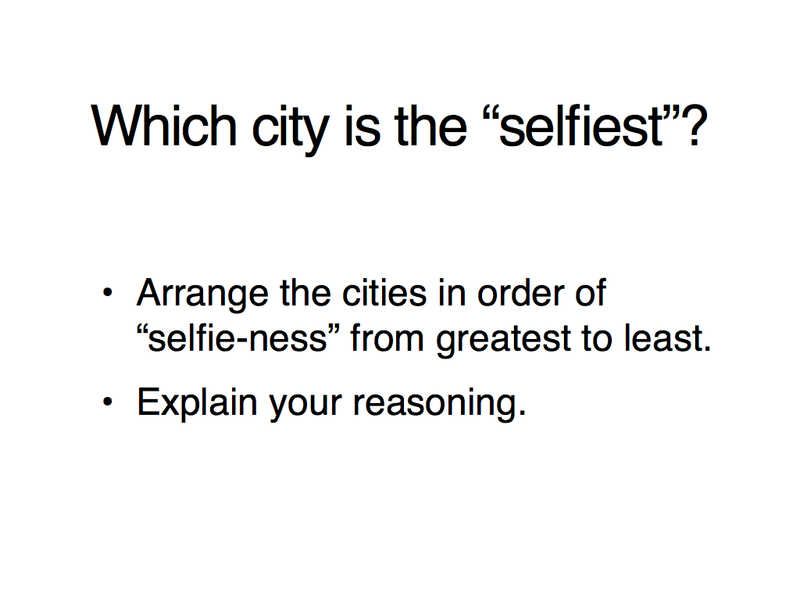 Last week, I came across TIME’s ranking of the “selfiest” cities in the world and created the math task below. Show the first slide–”sharing learning intentions” and all that. 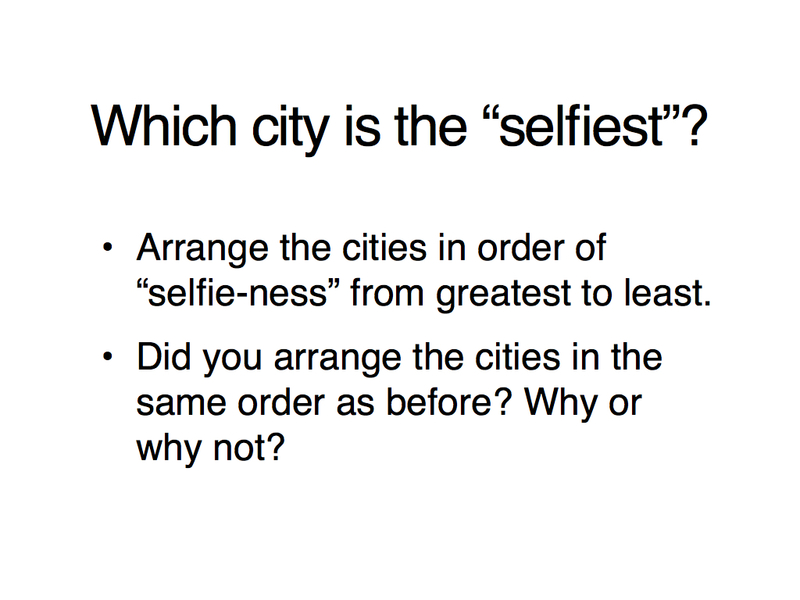 Display and discuss the selfies in Slides 2–8 to provide the context. 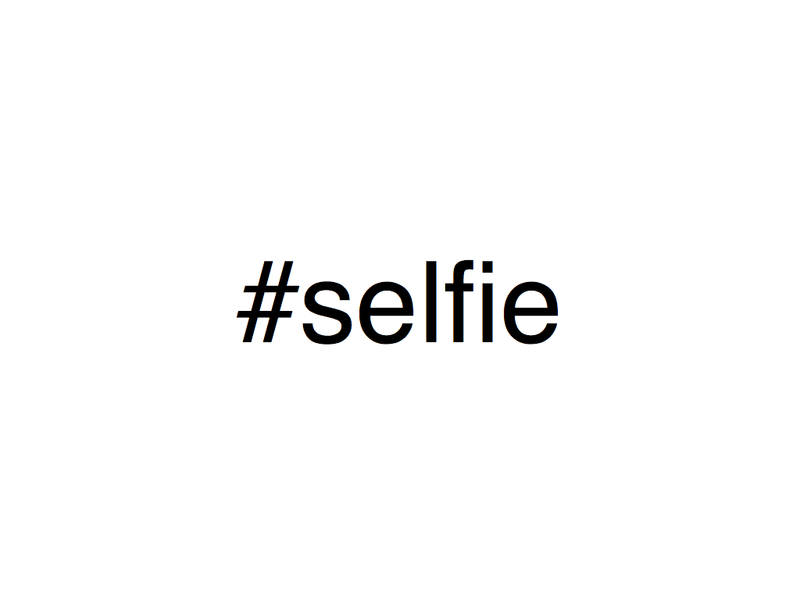 Also, this will be helpful in the event that some don’t know what a selfie is. Hey, it happens. Each year I’d have to explain rock-paper-scissors to at least one of my Math 12 students (tree diagrams & experimental vs. theoretical probability & law of large numbers). 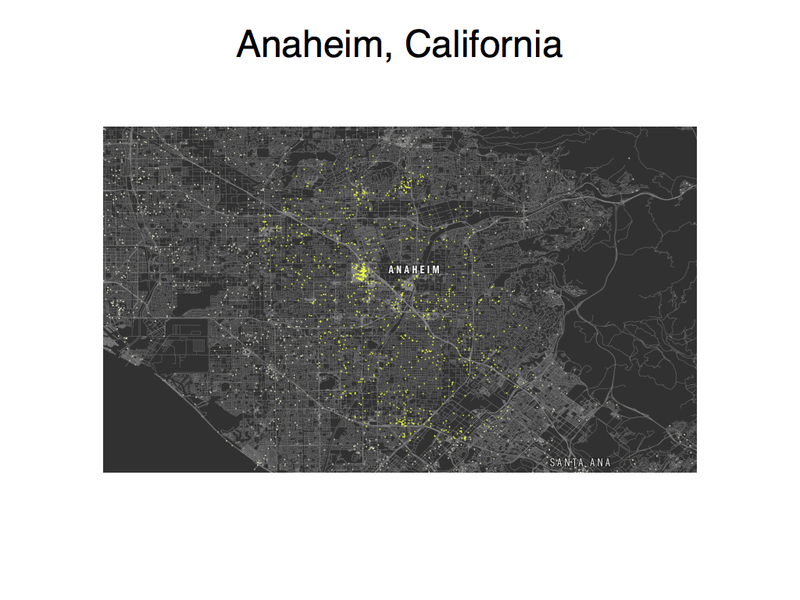 Show the map below and ask students what the data might represent. 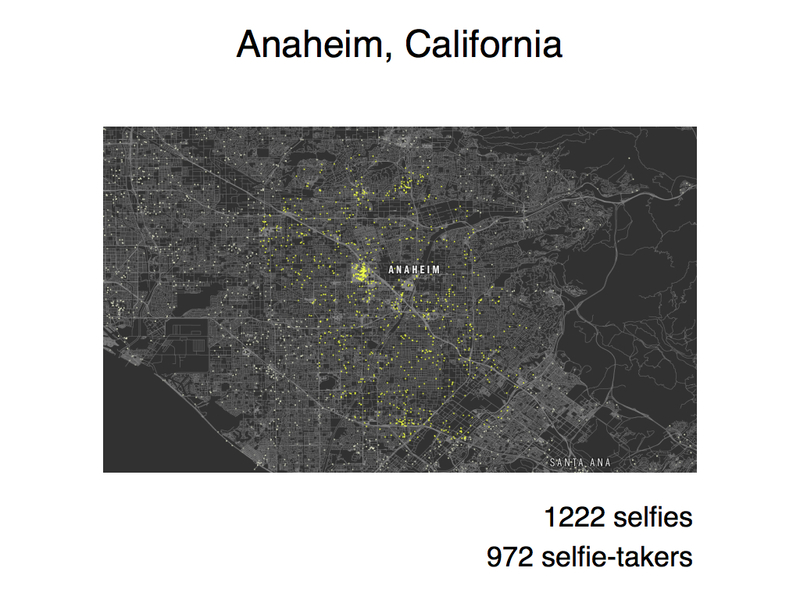 Given the previous discussion, I’m confident they’ll infer that each yellow dot represents one selfie taken in Anaheim. Yep, that’s Disneyland–Las Vegas for kids! Provide more details: each dot represents one Instagram photo taken during a 24-hour period tagged selfie that included geographic coordinates. …which should lead to this question. Hand out cards for Anaheim, Milan, and six other cities to pairs of students. 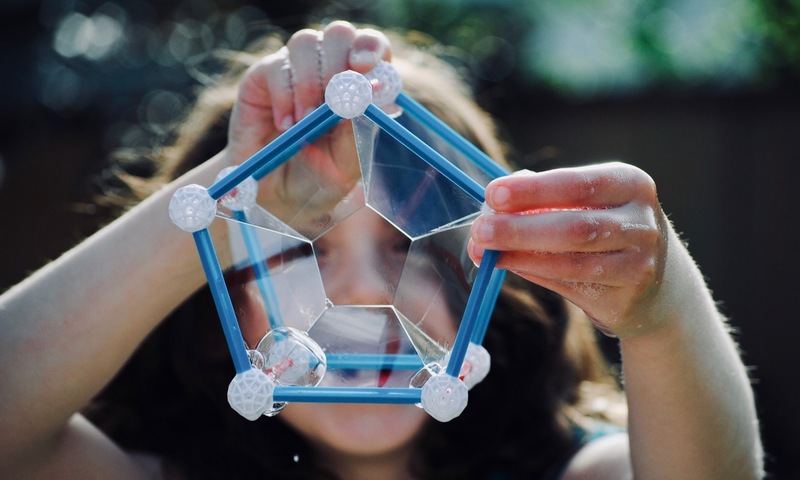 Call on students to share and justify their rankings. Note that there is (probably) more than one possible ranking. Provide more information: the number of selfies and the number of selfie-takers. Have students write this information on their cards. Ask students to revisit their rankings. Call on students to answer the questions above. Provide still more information: the population of each city. Again, ask students to revisit their rankings. Fingers crossed, some students will divide the number of selfies or number of selfie-takers by the population. 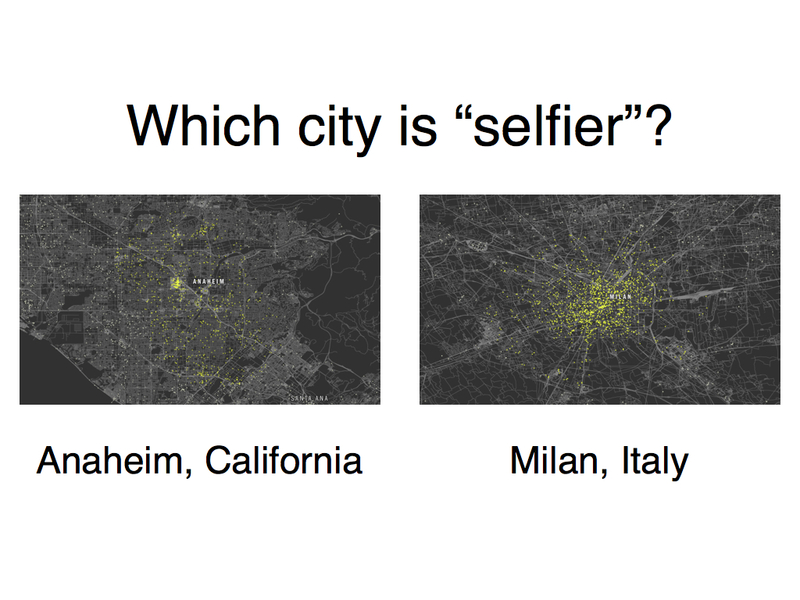 Maybe ask, “Is it fair to compare Anaheim and Milan, knowing what you know about the two cities? What about Manhattan and Miami?”? Again, call on students to share and justify their rankings. 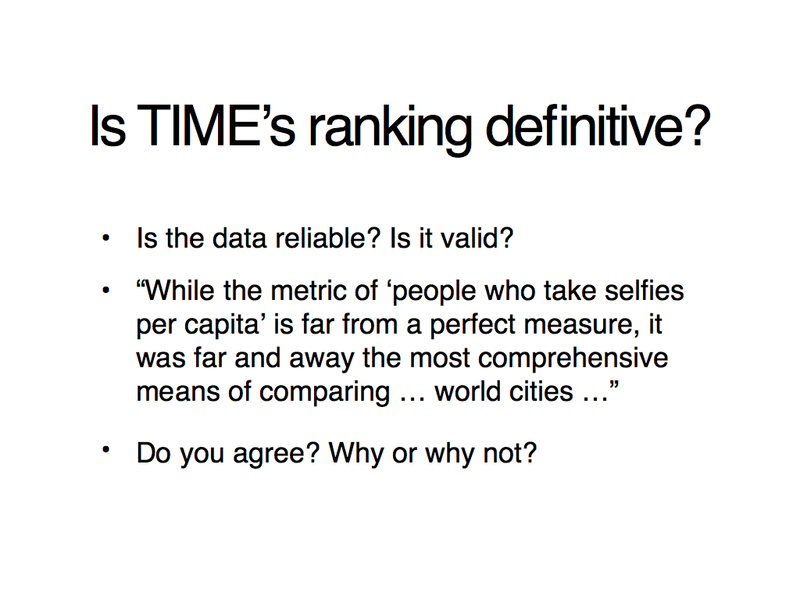 Share TIME’s ranking and methodology and have students critique the reasoning of others. Remember: the required Instagram-hashtag-GPS combination means TIME’s data accounts for a fraction of all selfies taken during a 24-hour period. Also, how many selfies taken in Anaheim (or Manhattan or Miami or San Francisco or Honolulu or Paris or …) were taken by tourists? 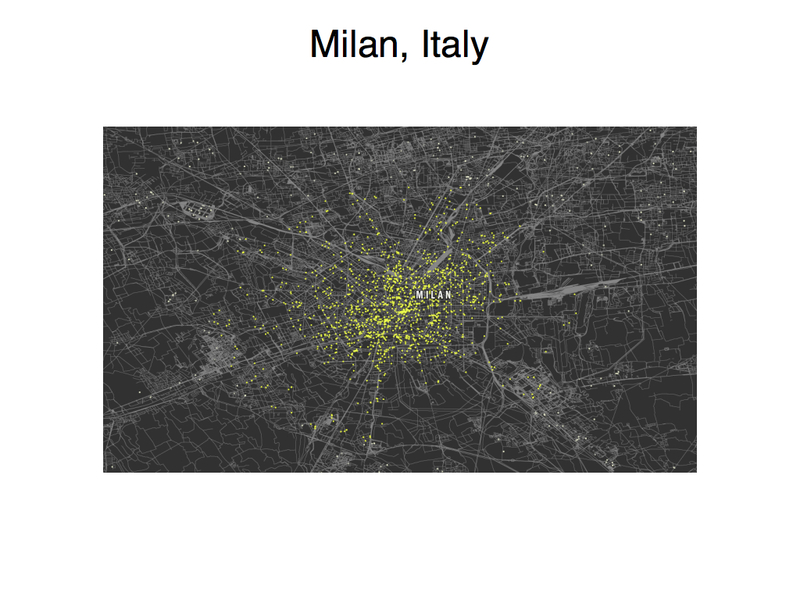 Is it fair to divide by that city’s population? For my first attempt, students ranked the data once, armed with all of the data–map, number of selfies/selfie-takers, and population. I wasn’t confident that students would use the population. 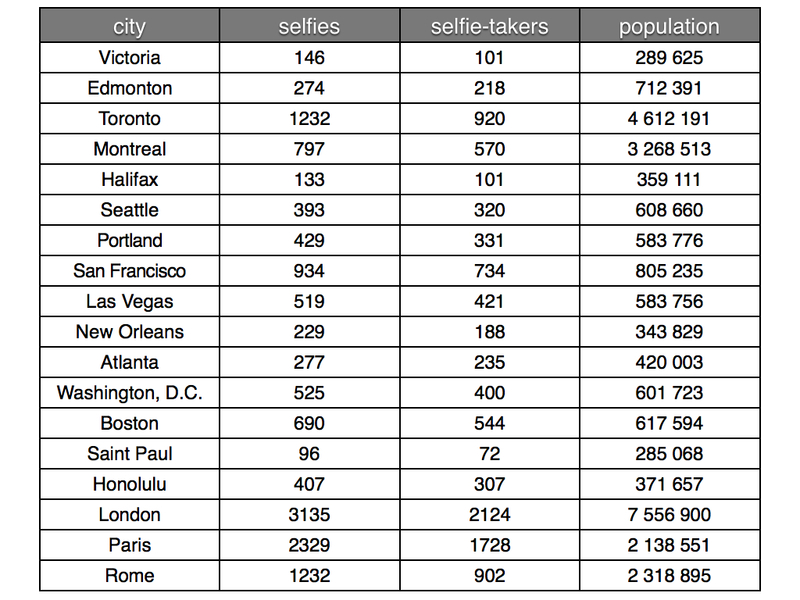 Number of selfies per capita is a bigger leap than, say, party over business. Marc suggested the three successive rankings. I think this will work better.